We are a NEW construction in Granbury and adding on - Phase 2!. 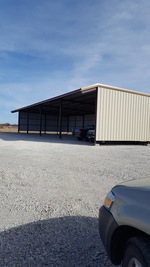 We will have a variety of unit sizes to meet every storage need. Reserve yours today! As large as a 1 ½ car garage. A 10' x 30 personal unit can hold the contents of six rooms, such as mattress sets, sofa sets, entertainment centers, over-sized furniture, appliances, patio furniture, garage items, and many boxes. This size is perfect for those in-between homes while in the process of moving or building a new house.